A magician must always be in control while appearing to not be in control, and to make that work he or she must perfect the “Magician’s Choice.” This is not a trick so much as a tool, or even more accurately, an idea, one that will come in handy for a lifetime of magic. 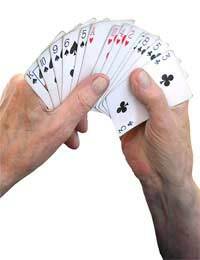 The magician lays out four cards on a table and asks the spectator to choose two of them. The spectator touches two, and the magician says “Fine, we will use these two” and discards the others. He then asks the spectator to chose one, and he does, after which the magician says “That is your choice, so we will discard this one” and does so. The remaining card, which seems to have been freely selected by the spectator, is named by the magician before it is turned over, and when it is the magician is proven correct. The secret to the Magician’s Choice is that it is a false choice, one which the magician only appears to be giving to the spectator. The magician is in control of the outcome of the choice from the beginning. The Magician’s Choice can be done with any number of trick, so the materials will vary based on the trick being performed. A complete understanding of the Magician’s Choice concept is required, and practice in at least one trick. The magician then asks the spectator to choose one more card, and once again uses the Magician’s Choice to control the outcome. The magician wants the spectator to wind up with the known card so that the magician can announce the card’s name and amaze the audience. To that affect if the spectator chooses the known card the magician says “This is the card you have chosen, so let’s get rid of the other one…” and if the card is not picked the magician says “Okay we will get rid of that card you touched, leaving us with this card…” Either way, the magician gets to reveal the identity of the lone remaining card. The trick is to never let on before the choice whether or not the spectator’s choice is going to mean a card is kept or a card is tossed away.